The weather was overcast and in the 50s on that Sunday last October, as Dan Marinos ponied his horses on a quiet country road in West Newbury, MA. “I’ve done this hundreds of times,” Dan wrote to me as background to what happened next. Dan and I connected through my work as a bicycling instructor. He wanted me to spread the word, so that all cyclists would know how to avoid what could be a dangerous or even deadly situation. What was the threat? Two cyclists, who had ridden up behind Dan and his two horses. Dan was astride one and ponying (leading) the other. “The cyclists came up silently and were upon us in an instant, much like a mountain lion would behave,” Dan wrote. “The ponied horse spooked and bolted. The horse I was on did the same, herd instinct it’s called. “I had to let go of the second horse in order to gain control of the horse I was on,” Dan continued. “The loose horse lost his footing, went down, and slid 40 feet on his side. Recreational horseback riders frequent many of the same trails as mountain bike riders. Amish horse-drawn buggies are common in some rural areas. Urban areas have police patrols on horseback, and horse-drawn carriages are popular with tourists. This sign is often posted on trails. It’s a start in dealing with horses and their riders, but there’s more to that than the sign can show. 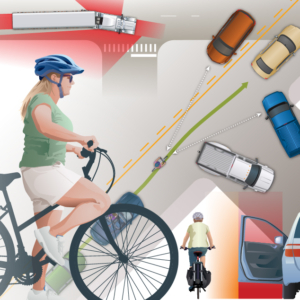 Communication is central to success as a bicyclist. With other road users, it is mostly through lane positioning, hand signals and head turns. Horses, though, respond to different signals. “Approaching from the rear is a whole different story. They don’t see you or hear you. It is imperative you announce your approach from a decent distance. So – horses, as imposingly large as they are, are nonetheless prey animals, like deer and squirrels. Their instinct is to flee danger. In the early days of bicycling, bicycle-mounted police were often called upon to bring stampeding horses under control. We’re not asking you to do that, only to avoid causing them to stampede in the first place. It isn’t only the horse and rider who could be injured. It could be you, too. This article has been about not inducing fear. But also, you might turn that thought back on yourself. Just as an example, do you have a clenching feeling in your belly if you hear car tires screeching? Humans also experience fear, and many are fearful of bicycling. 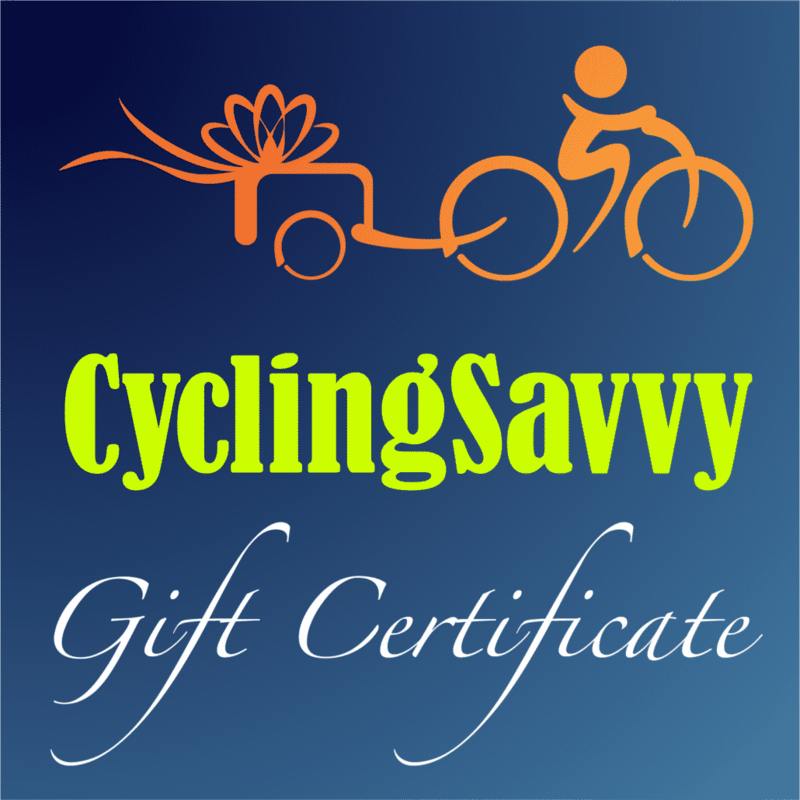 With CyclingSavvy instruction, cyclists discover how we can shed – not suppress – that fear, through bike handling, positioning for visibility and safe maneuvering, and proactive communication with other road users. These strategies avoid your surprising a driver and having car tires screech in the first place. I extend many thanks to Dan Marinos for his concern and attention – and for writing most of this article for me. 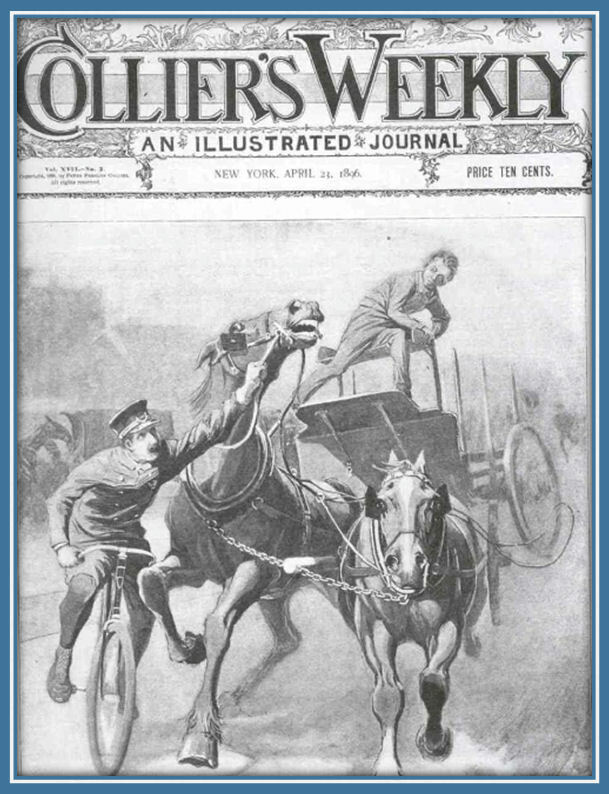 Also to Kirby Beck for digging up the stunning Collier’s magazine cover.